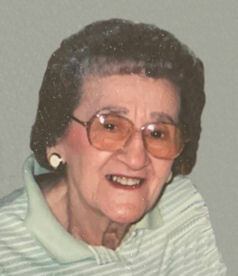 Mary Ann Hentges (nee Bors), 101, of Lorain, died Saturday January 26, 2019 at Mercy New Life Hospice Center of St Joseph in Lorain. She was born April 28, 1917 in Curtisville, Pennsylvania and moved to Lorain when she was 7 years old. She attended Holy Trinity Elementary School, Hawthorne Junior High School and graduated from Lorain High School. In the late 1960’s, Mary worked as a postal clerk and sales clerk at Middendorf Drug Store in Lorain, as a salesperson at JC Penney in Grand Island, Nebraska where her husband Paul was stationed in the Army, and at the Lorain Clear Sylk Store. Later, she was employed at St Joseph Hospital for 15 years as a nurse’s aide before advancing to the hospital public relations office as a secretary. Mary Ann was also a member of the Hospital Guild and served as the hospital credit union secretary before retiring in 1979. Mary Ann was a life member of Holy Trinity Catholic Church in Lorain where she volunteered as church financial assistant and was a member of the Slovak Catholic Sokols Wreath 111 and the Altar & Rosary Society. When the church was closed, she became a member of Nativity of the Blessed Virgin Mary Catholic Church in Lorain. Among her many interests were fine classical music, church music, bowling and watching live sports and televised sporting events, especially the Cleveland Indians and Cleveland Browns. Mary Ann’s family would like to thank Adult Care by Sandy for the love, kindness and care they gave Mary Ann for the last 6 ½ years. She is survived by Monica (husband Varun Verma) Nardini and Michael Nardini whom she considered her grandchildren and their parents Victor & Denise Nardini of Lorain; cousins Bobbi (Jim) White of Amherst, their daughter Rebekah (Rastó) Janiš and their children of Lorain. She was preceded in death by her husband of 23 years Paul Hentges in 1962, parents John J Bors Sr and Anna Bors (nee Straka), brother John J. Bors Jr in 2003, sisters Anna M. Bors in 2005 and Helen T. Kozloski in 2009; brother-in-law Henry (Hank) Kozloski in 2013 and sister-in-law Mary Kimmel Bors on 2017. A mass of Christian Burial will be held Thursday January 31st at 10:00 am at Nativity of the Blessed Virgin Mary Catholic Church, 1454 Lexington Ave, Lorain. The Rev. Robert J. Glepko, pastor of Nativity BVM Catholic Church in Lorain and the Rev. Leonard Bacik, pastor of St. Bartholomew Catholic Church in Middleburg Heights, will concelebrate. Burial will follow at Calvary Cemetery in Lorain.